For the first time in the history of SFMOMA’s biennial award program honoring Bay Area artists, the museum has commissioned the four recipients of the 2012 SECA Art Award to create work outside the traditional gallery context. Their site-responsive projects are at several locations throughout the Bay Area. To complement these projects, Open Space has commissioned a piece of writing on each of the four locations. Today, professor and writer Richard Walker on the Presidio Forest, where artist David Wilson‘s work appears. The Presidio is a lovely corner of San Francisco, a place to explore on foot and find refreshment from the hubbub of urban life. 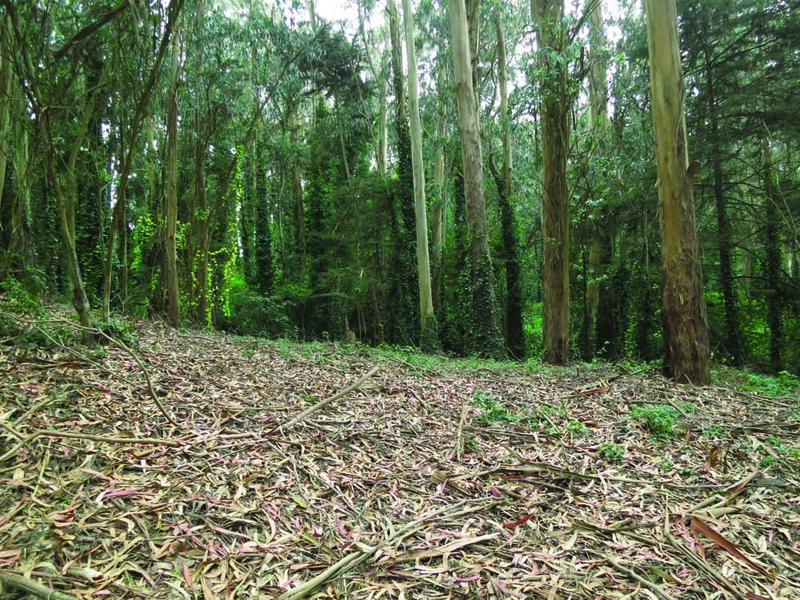 Roughly a fifth of the Presidio’s 1,500 acres is covered in woodlands offering shady walks and leafy prospects — the Presidio Forest. It is easy to think of these woods as the anti-city; they are even part of a national park, and what offers more promise of wild land than that? Nevertheless, the Presidio and its forest are as much a part of the urban landscape as Van Ness Avenue, their own kind of human artifice and haunted by the city’s history. The Presidio sits astride one of the many hilly protuberances of San Francisco, which were lapped by a sea of sand before the Gold Rush. Walking through the Presidio Forest you can still feel the sand underfoot, a reminder of the immense coastal dunes that once held the city at bay and extended all the way to the foot of Market Street. The dunes are the legacy of ice age river deposits and the relentless winds and waves of the Pacific. Clinging to sand and rocky outcrops were plants and animals of the coastal chaparral ecotone, including several highly localized species. With the dunes now covered by the city hardscape and introduced plants, most of the indigenous species are extinct or endangered, like the single Franciscan Manzanita found along the new route of Doyle Drive. 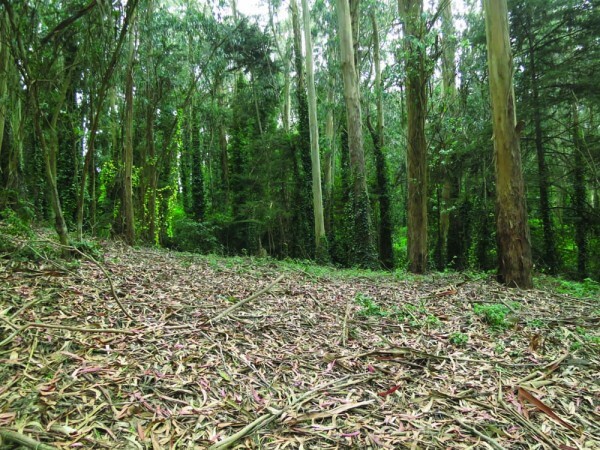 Today there is a lively effort to restore native plant habitat along the margins of the Presidio, which would be greatly advanced by cutting down the non-native forest, as was done on Angel Island State Park. Golden Gate Park, launched in 1868, was the antecedent for the Presidio Forest (indeed, there was even a proposal to turn the Presidio into a city park in 1872). As engineer William Hays Hammond learned how to gain control of the shifting sand, it could be planted up into a pleasure ground on the model of Central Park. Such pastoral landscapes were all the rage in nineteenth-century cities, reminding Americans of a lost agrarian paradise of their imaginations. Yet Frederick Law Olmsted, called west by the city fathers, recommended a park along what is now Van Ness Avenue, to be planted in natives — a radical idea for the time. Most early San Franciscans found the windswept vistas disturbingly alien, and preferred to plant them up to look like their homelands back east. The Presidio Forest further comports with the general mania for tree planting that swept the country in the late nineteenth century. Much of the Bay Area, including Yerba Buena Island, the East Bay hills, and nearby Sutro Heights, had already been carpeted with fast-growing Monterey pines and Australian eucalypts. In 1883, Major W. A. Jones proposed doing the same on the bare hills of the army base, and the job began on Arbor Day, 1886. A few years later, some 400,000 trees had been planted, mostly in a helter-skelter manner and in overly dense stands. Ironically, although contemporary neighbors complained that the trees interfered with their views, a century later people were outraged when the army dared to cut down some of the trees. The image of the Presidio as a wooded sanctuary had become completely normalized. Since the Presidio Forest began in imitation of a park, it is only fitting that it ended up part of one. The Golden Gate National Recreation Area was created in 1972, the inspiration of elder conservationist Edgar Weyburn, new recruit Amy Meyer, and powerful Congressman Phil Burton. The army finally packed up and moved out in the 1980s, and the Presidio was handed over to the National Park Service in 1994 — with the bizarre proviso that it be self-financing, thanks to a Newt Gingrich–led Congress. The core areas of the Presidio are now managed by a money-minding Presidio Trust. Nonetheless, the GGNRA mostly functions like a people’s park thanks to citizen activism, especially through the Golden Gate National Parks Conservancy. Neither the pleasant greenery of the Presidio nor its park status should let us forget its long engagement with the military and imperialism. The Presidio began life in 1776 as the northernmost outpost of an overstretched Spanish imperium. As the empire lost control of the Americas in the early 1800s, Mexico continued the project of native eradication and integration into the European world system. In 1846, the imperial mantle passed to a pugnacious United States, which seized the Golden Gate for battlements to guard its Pacific flank, newly seized from the Mexicans, and installed the headquarters of the western army at the Presidio. For the next fifty years, that army led brutal campaigns against native peoples across the West, and then put down the independence movement in the Philippines after the Spanish-American War of 1898. In the twentieth century, the Bay Area continued to serve as the logistical pivot for men, materials, and munitions heading across the Pacific to defend the American empire through two World Wars, the Korean War and the Vietnam War. Today, Fort Point, naval batteries, and Cold War missile silos stand in mute witness to the endless obsolescence of military technology. The Presidio, having acquired the luster of age and respectability, has been made a national historic landmark. Fort Funston memorializes the captain who captured Emilio Aquinaldo, a memorial to the missing of World War II is tucked into the trees, and a Korean War memorial is in the works. But where is the memorial to a million or so dead Indians and Filipinos? At Alcatraz, at least, the park service observes the Native American takeover of the island in 1969. Given the gloss on the Presidio’s dishonorable past, perhaps the Walt Disney Family Museum on the central parade ground isn’t out of place. After all, Walt was an American master of nostalgia, American pastoral, and papering over historical unpleasantness. Found SF digital history archive, http://www.foundsf.org. Halloran, Pete. “Seeing the Trees through the Forest: Oaks and History in the Presidio,” in Reclaiming San Francisco. 1998. Meyer, Amy. New Guardians for the Golden Gate: How America Got a Great National Park. 2006. Silbey, David. A War of Frontier and Empire: The Philippine-American War, 1899–1902. 2007. Sloan, Doris. Geology of the San Francisco Bay Area. 2006. Spicer, Edward. Cycles of Conquest: The Impact of Spain, Mexico, and the United States on the Indians of the Southwest, 1533–1960. 1962. Walker, Richard. The Country in the City: The Greening of the San Francisco Bay Area. 2007. Richard Walker is professor emeritus of geography at UC Berkeley and former chair of the California Studies Association. He has written widely on the Bay Area and California; his books include The Atlas of California: Mapping the Challenges of a New Era (2013), The Country in the City: The Greening of the San Francisco Bay Area (2007), and The Conquest of Bread: 150 Years of Agribusiness in California (2004).